NEW YORK (CNNMoney.com) -- Hate the mess your home has deteriorated into but you don't have the time or means to do a comprehensive redecorating job? Or maybe it's time to sell your place, but you don't know how to show it off to best effect? Take Christopher Micaud, for example. 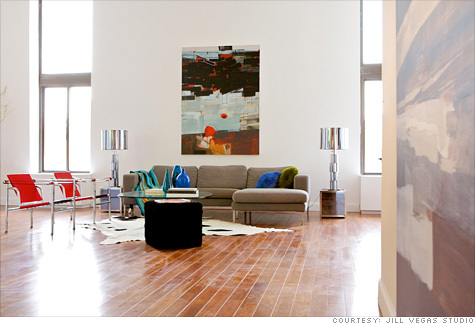 The fashion photographer needed to spruce up his Lower Manhattan loft with soaring ceilings and cityscape views in order to sell it. He soon, realized, however, that he faced a daunting task. For one thing, his home has only two tall windows, both on a living room wall. And when guests walk in the door, they're confronted with a staircase, looking spindly and forlorn. "We started to fix it up ourselves and came to a dead stop," said Micaud, who bought the 1,800-square-foot loft two years ago for $1.5 million. Instead, he called in Jill Vegas, author of the new book "Speed Decorating," who focuses on redecorating at a minimum cost and warp speed. Ideally, she makes the most of what you have, showing you how to arrange it, what colors to paint, where to hang your artwork -- and what flourishes to add. "It's about having a home you love right away," she said. "Speed decorating is not about calling in contractors; it's about looking at a room and thinking about what you can do in a couple of hours, a week, to make it better." When she first arrived at Micaud's loft, she was not pleased. The entry opens onto windowless space facing the staircase. And to the left is a foyer with a sofa that has seen better days pushed against a blank wall. "We need to have an amazing first impression," Vegas said. "You've already lost your sale. We want somebody to be curious enough to look further." She also criticized the kitchen as tired and dingy. Plus, the traffic flow to the living/dining area was obstructed by two poorly arranged chairs. And overall, she found the decor to be too empty, too cold. Vegas did find a few strengths, including the windows: "This is an amazing view. A giant city view. This is what people want," she explained. To build on that, she had a few suggestions of where she and Micaud should start. First, move those poorly arranged chairs to the side to make the seating area more welcoming. Second, paint. Third, Micaud should take photos from his collection, have them framed, and adorn the mostly-bare walls. "We're creating a lifestyle, but we need some of your personality to sell it," she said. Vegas worked mostly with what the Micauds already owned. She loved a modern floor lamp with a long neck that was lost in a corner. It now makes a more dramatic statement dangling over the dining table. A vase of tree branches, which she pruned, took its place by a window, adding an outdoor echo to the urban streetscape beyond the glass. The sectional sofa was pushed against the wall between the views and flanked by striking new lamps with silver shades. Paintings came out of storage to provide splashes of color for the otherwise monotone walls. She also suggested painting the closet doors, replacing bathroom faucets and getting new electrical switch plates as quick, easy solutions with big impact. Finally, she added several pieces of furniture and accessories. Vegas said she believes people can improve their living spaces following seven simple principles. Create a sense of calm. Clear out clutter and organize what's left. Shape up your rooms. Homes get out of condition. Getting them back in trim first requires a good cleaning during which you can note what needs to be repaired, replaced or repainted. Incorporate personal style. Try to make rooms reflect you, whether that means warm tones and plush upholstery or stark lines and spare features. Work out arrangements. Define the functions of different parts of the room. Once you know that, it's easy to figure out where your furniture and accessories belong. Work with light. Kitchens and baths want bright "task" lighting, while in bedrooms and dining areas need softer, more romantic lighting. Embrace color and texture. Look to nature for inspiration. Think of some of the colors you liked on recent vacations and reproduce them. Find the devil in the details. The heart of speed decorating is using art and accessories to give your home uniqueness and attraction. A consultation with Vegas costs $500 to start. Often, that's all the homeowners need. Others do the actual work themselves but have Vegas consult, paying $2,000 to $6,000 for those services. A job like she did for the Micauds, where Jill and her team did all the work, can cost from $5,000 to $25,000. Micaud thinks he'll make back the money he spent when he sells his home. He might. The results of the redecorating, which took a couple of weeks, mostly to prep and paint, were dramatic. The tone and feeling of the loft had changed -- for the better. The lighting was more stylish. The kitchen had become a sleekly seductive asset rather than a liability. The foyer area looks so much better with a curvy modern table replacing the old tired sofa. The look is completed with a tall vase of flowers reflecting in an ornately framed mirror. The living room seems larger and more welcoming even as it retains its simplicity of cool lines and minimal clutter. The loft is now being marketed through Sotheby's International Realty with a price tag of $1.895 million. Micaud might not get that much in today's down market, but he now has a much better chance.